Kat and I are on a train heading back home from NYC after a wonderful few days. 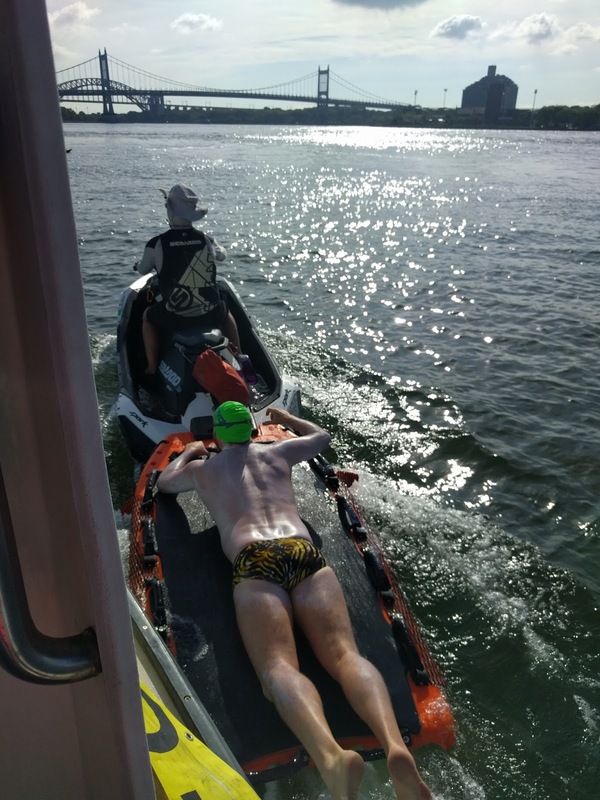 I plan to recap the swim in this post and perhaps one and maybe two more to finish up my Triple Crown posts. Afterwards, I have plenty of updates about my Dad's progress along the Camino de Santiago (aka "The Way"). To keep these topics separated, I will post about my Dad later. For now, sit back, relax with a beverage, snacks or whatever floats your boat.....and read. Here goes nothing. A Huge Thanks. I want to thank everyone up front before recounting the swim. First, the swim would not be possible without the continued, selfless help from my wife Kathy (I call her Kat but you can call her whatever you like). She accompanied me on all three swims - including this one in NYC. She gave me breaks in my household responsibilities, never challenged any crazy rationale for extra workouts, and cheered me on. Not only that, she endured conditions she is not accustomed to nor comfortable in during all these swims. She is the best; plain and simple. 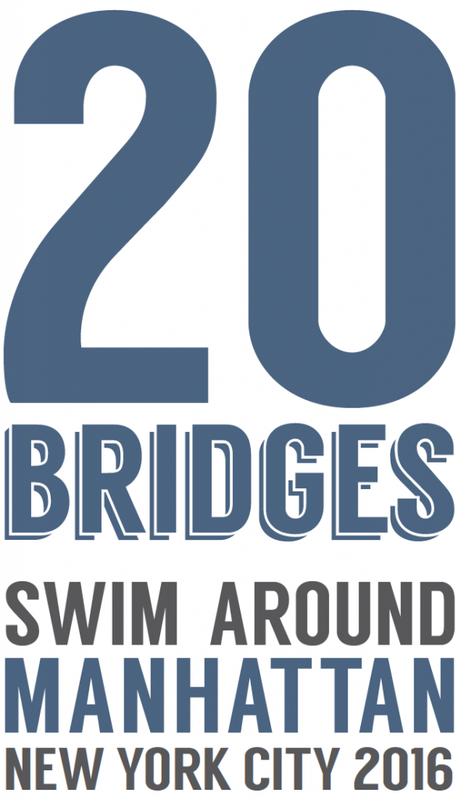 Second, I want to thank the organizers of the 20 Bridges Swim (David Barra, Rondi Davies, and Alex Arévalo) who accommodated me for the swim. They made it possible after Kat allowed me to get fit enough to do it. My friends Yuta Tsuboi and Phyllis Ho also played a key role because they encouraged me to even pursue the option. Both of them sent me a Facebook message saying that I could break the Triple Crown record if I could get into the August 15th event. Combined, they all made this possible. Third, I am incredibly grateful to my crew - Fred Zamon (observer and friend from GMU Patriot Masters), Cheryl Ward (coach at GMU and friend), and Brendan Cooperkawa (aka "Coop" - one of my oldest and dearest friends from grade school and high school and also a fellow swim team member in high school who flew in from Chicago to be part of this adventure). 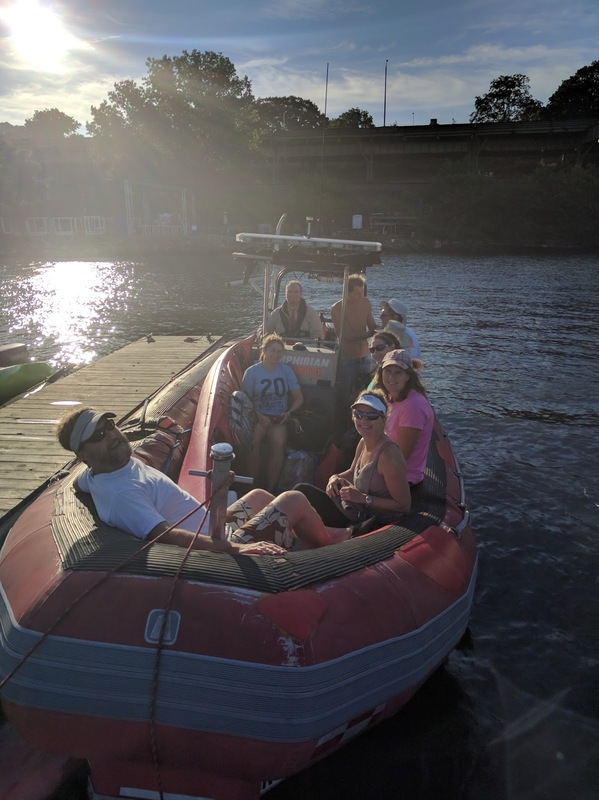 The crew - along with Kat - kept watch over me and communicated with Michael Smalley (my kayaker and an awesome teammate as well) throughout the swim. My crew rocked! They all braved some nasty heat and kept me positive in spite of my heat intolerance and grumpy mood that waxed and waned throughout the day. Thanks to you all, the swim was a success. Oh, last but hardly least, the list would not be complete without acknowledging the tremendous help provided by all the supporters out on the course and at home monitoring all the swimmers progress around the island. You all played an important role in making the event special. So thanks to you all, we did it! The Night Before. Kat and I decided to get an AirBnB up by the start of the 20 Bridges Swim. The start of the swim actually took place on the upper East Side of Manhattan but we all convened way up on the Northwest side of Manhattan on 207th Street - right on the Hudson river. Our AirBnB was just a few blocks away and allowed us a few extra hours of sleep or so we thought. I just couldn't muster any sleep that night. Between the mental checklists and somewhat chaotic, last-second packing for the trip, my mind was too active to sleep. How chaotic was my packing? I assumed I had Desitin from my English Channel trip. Did I? Nope. Brendan and Kat ran out and got a small tube so that gaff was fixed without too much hassle. Forgetting that important equipment lead me to wonder what else I may have forgotten. So, did I sleep? Nope. Instead, I drank water, went through my things to do and went to the bathroom - almost every 30 minutes. Sleep would have to wait for another day. We did get to "sleep in" until 5am. Wow, how nice, huh? Early Morning - Swim Day. After waking up, I prepared my feeds (CarboPro in 1.5 liter bottles) and sorted out my swim gear. I was all set. Gear check confirmed I had everything and proved that worrying about forgotten things would not make them appear nor would the worrying help. I had everything now and I just needed to eat a bit. The previous night, we shopped for food and I purchased some scones. Should have purchased a few egg sandwiches but instead I opted for a stomach neutral scone (or 4 to be exact). Additionally, we each purchased a hug cup of cold brew coffee from Starbucks to consume in the morning. 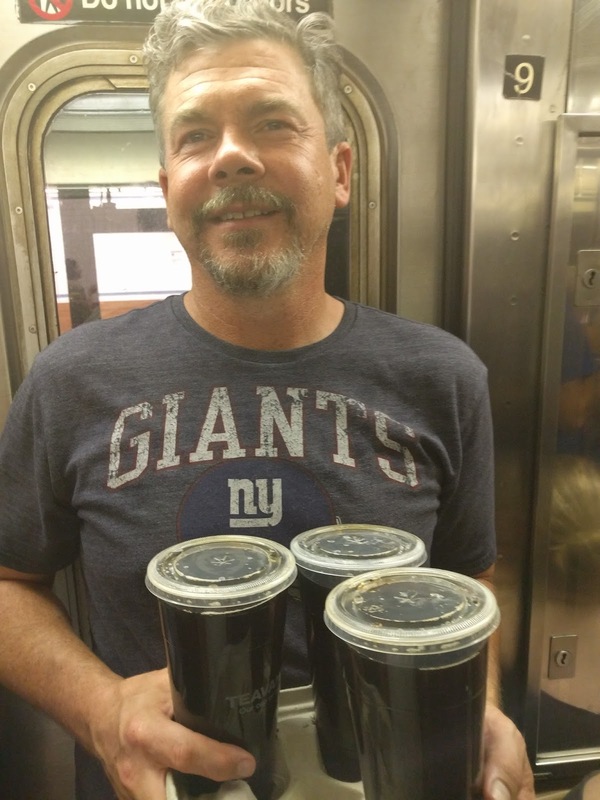 Coop carried it on the subway up to our place. We doubted our neighborhood had a Starbucks; later, we learned how wrong we were. Oh well. Oh, that cold brew stuff rocks. Yes, I admit it. I like a faddish thing like cold brew coffee. La Marina - Before the Start. Our instructions were clear. The event organizers wanted us to meet at La Marina at 6:30am and then later for a mandatory 6:45am crew and swimmer orientation. That meeting was quick, efficient, and useful. We all learned about the course and crew responsibilities. My only wish is that all my meetings were as effective and efficient as the NYOW meetings. I have a new model that all future meetings shall be judged by - and I fear none will meet that standard. Once the details were clearly described, we all headed to our respective boats. 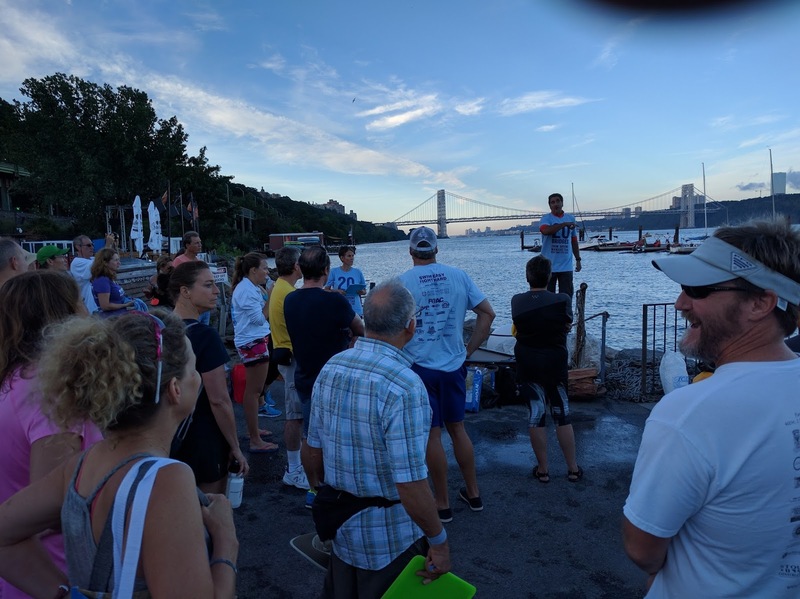 My team's boat was coming from Staten Island and would meet us at the start on the East River side. Thus, we had to climb aboard another team's boat and get ferried over to the start (and our boat). Yeah, I know girls...steady your hearts. The walrus is on the float. I realize this was the least exciting part of the swim but it was the part that set me up for success (or later struggles). Wait for my next post to hear what really happened. Really tired and plan to send a more thorough update but before I crash....or rather head out on the town, i want to thank a few people. Thanks to my awesome wife who selflessly supported me for all my crazy events. I love you so. Thanks to my crew - all of you for all three swims. Without you, I never had a chance. Kat and I thank you from the bottom of our hearts. Finally, and not the least, thanks to you all who supported me. I really appreciate all of your kind thoughts. OK, time to celebrate. Kat is crashing. She earned it. Brendan and I didn't I guess. In NYC - the day before the swim. Time to eat! Greetings from NYC! Kat and I got up here late last night, stayed in a Holiday Inn Express next to Penn Station, then met my pal Brendan for breakfast. 1. Cold noodles with sesame sauce - the greatest Chinese dish not readily available outside NYC. Yes, there are knockoffs but we are going to the 2 1/2 star Empire Szechuan Gourmet. They may not get the highest ratings overall but they are the home of the finest cold noodles with sesame sauce. 2. Walk around the village. No beer or drinks for me as I try to rest up for my swim. Instead, I will consume water, dodge the heat, and get mentally prepared for a fitful night of sleep. 3. Dinner. Don't know where but it will be great. Coop (aka Brendan) and I are already scheming where we will eat on Tuesday. Tonight is a little uncertain. I was hoping for an Italian meal but I'm flexible. Any suggestions from New Yorkers? OK, off for our first treat. 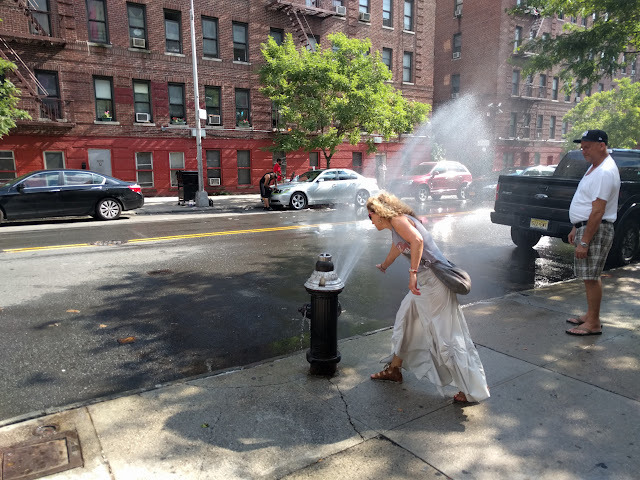 Forgot to mention, we are in a heat wave. Bloody hot here. My full figure can only take so much heat. I'll survive. Not happy but will survive. Hope to post some pictures later. I have more information about the swim. The event organizers sent out a flurry of email updates and I will dutifully relay them to you readers here. First, I will be one of the 9 swimmers participating in the event this year. The other swimmers hail from as far away as New Zealand - via the Netherlands - and a few are as local as I am. The list of swimmers, crew, boat assignments, and observers can be seen on the NYOW website. You'll notice that we leave the boat landing at 7am but don't start the swim for another hour or two. The start is staggered based upon the expected pace. I put down an average 1:40 pace per 100m - my forever pace. I can't swim a ton faster but I can keep that pace for probably 24 hours. So, based upon that pace, I get to start at 9am (see above). Third, the organizers sent us some expected times for specific landmarks along the swim. Here are the expected times based upon my pace, the current, and probable weather/wind conditions. The numbers above indicate the location on the map below with one exception. The finish is the same as the start so I placed that at the red bold #1 below. Finally, I did a little research to find out about the tides and conditions I am likely to face during the day. 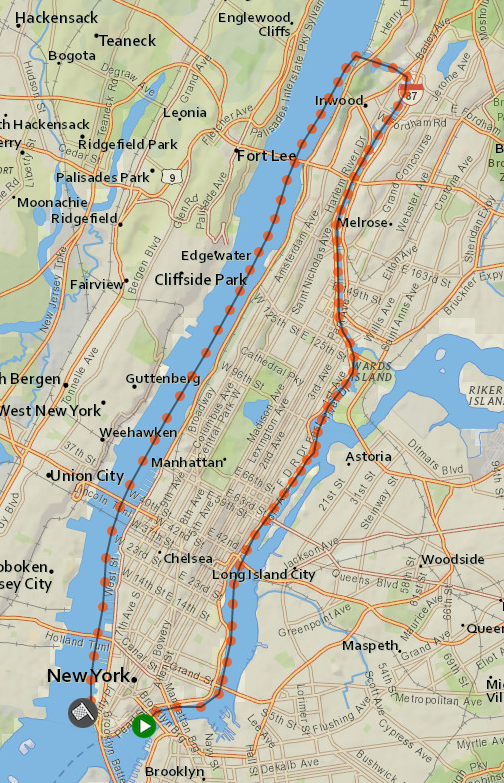 Here are a few snapshots of the currents in and around Manhattan. Start @ 9am (high tide is at 8:31am) You can see that the tidal flow from the figure below is a mighty 3+ knot push up north. The left most figure above should be the conditions I see at the start. Henry Hudson Bridge @ 11:02am (2.5 hours after high tide) Roughly 2 hours later, I round the northernmost tip of Manhattan with a 1.2-1.7 knot current pushing me around but then get hit with a slight current against me for a little bit. George Washington Bridge @ 11:43am (3 hours after high tide) I should get a slight current against me for this bit between the bridges. At most, the current will be at about .3 knots - not terrible but still against me. The Battery @ 2:15pm (low tide starts at 2:24pm) The figures below show the currents for low tide. At low tide (the leftmost figure), I see a 2.6 knot current in my favor. The trouble starts when I round the Battery and start heading up the East River. Finish @ 4:29pm (2 hours past low tide - third figure from the left) The current appears to be about 2 knots pushing me toward the finish at this point. One thing to note, however, is that I will have a slight current against me from 2:30pm until 3:30pm. During the last leg to Mill Rock, I will have an increasingly strong push from the current where it should be roughly 2 knots to my favor. I chatted with my Dad many times over the past few days. He is doing fine after a slight setback. A few days ago, he fell - nothing serious but he was really concerned about his hip. He was trekking along with some young teenager, chatting up a storm with the 60+ year younger friend when he slipped and fell trying to cross some water. As usual, he refused help and managed to make his way into a small town 8 miles from where he fell. Once there, he checked into a hotel where he soaked his wounds and then later took a cab into Pamplona to get checked out by a physician. All is well with him now after getting an anti-inflammatory shot and some other pain meds. He recovered over the next few days and resumed his trek on Thursday (2 days ago). I intend to chat with him before I swim so I'll have more to report. Also, I have tons more to post about his trek but need to head out to a party and then catch a train up to NYC. More later. I just finalized the paperwork or rather online forms and payment for my swim. 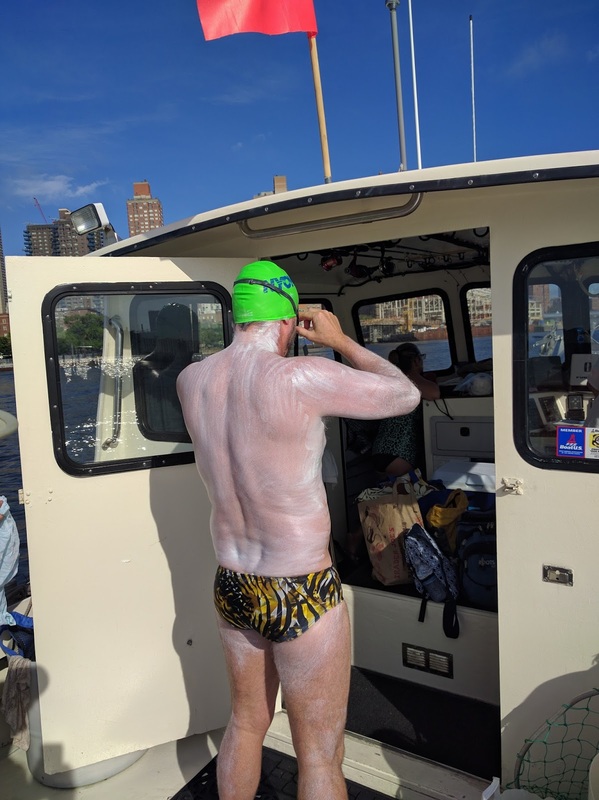 Thanks to Dave Barra and all the folks who work tirelessly for marathon swimming, I was able to get into the swim and attempt to complete the Triple Crown in fewer than 35 days. Today's post has two updates. If you can see the tiny font on the Y-axis, you'll notice he begins at about 250m above sea level and rises to almost 1500m for roughly a 1.2km increase over 20km or a 6% grade uphill. Put into normal terms, a 6% grade is the maximum grade for a US interstate highway. So, he'll be walking up a highway that is ascending into a mountainous area. He doesn't get much rest today and he is walking up a rather large hill with about 10lbs of water, food, and clothing on his back. I would say that is a huge effort. Oh, the unrealistic part? He thought he could average 3-4 miles per hour (5-6.5 km/h) walking today. I coached him to take his time. The Camino is long. My dad completed many marathons in his life and had a ton of adventure so he understood my suggestions and took them to heart. This journey is a marathon and he ought to treat it as such - go out easy and finish your first. Oh, the even more amazing part...he just had a round of chemotherapy before he left and I am sure he is a little weak from it all. I intend to post updates over the next month because his adventure is my adventure too. I hope you find these updates interesting and engaging. He'll be doing some purposeful walking, reflecting on his life, and sending me updates - some I intend to share with you. Thanks for following. Yes, the 20 Bridges swim is all paid up and I am chomping at the bit. Also, I am assembling my crew for the swim. Details were a little sketchy at first but I knew the NYOW folks would pull all the information together and keep us informed as needed. My crew is changing because some folks cannot get off work. I completely understand. 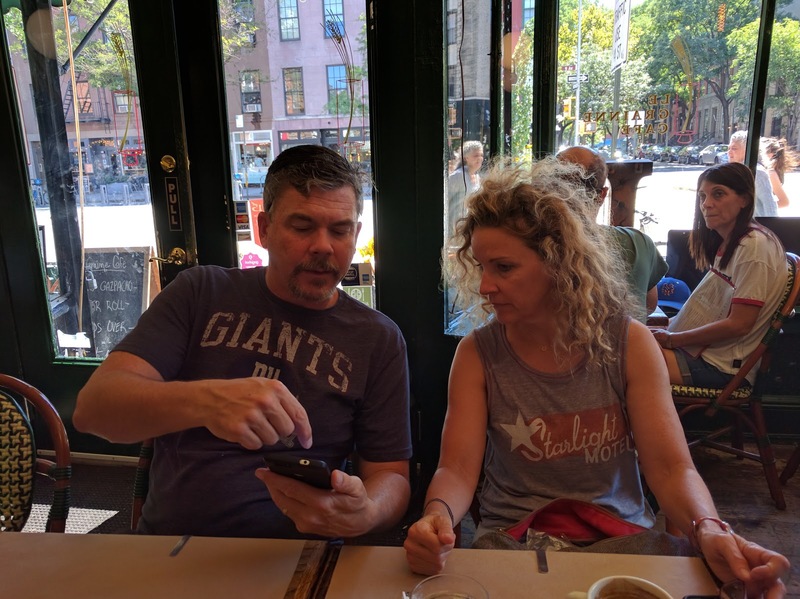 So far, the definite crew members are Kat (of course, we are going to complete this Triple Crown together) and my long-time dear friend or rather brother from a different mother - Brendan Cooperkawa (known to my son as "The Coopstah"...pronounced with the strongest Boston accent). We head up to NYC on the evening of the 13th after I enjoy a beer or two at a friends annual summer party. No, I'm not driving - taking Amtrak and enjoying a 4 hour nap. Should be a blast! 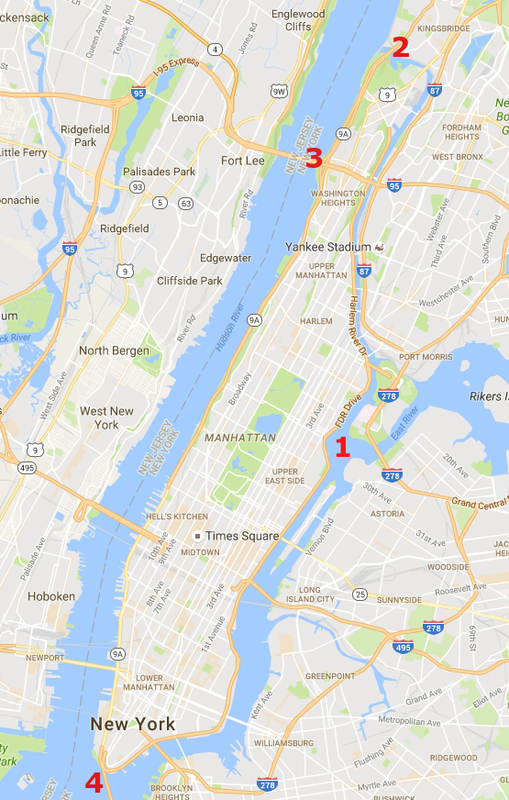 Below is a map of the swim - courtesy of the Tracks Database (developed by Evan Morrison and hosted by marathonswimmers.org). The track is Paul Newsome's swim on June 8th, 2013 in an amazing time of 7:02. My plan? Finish. I'll post more details as they come. For now, expect a flurry of information about the swim and updates about my Dad's adventures in France and Spain.